Friends of the Jefferson-Madison Regional Library will pay the $30 out-of-area library card fee for residents of Buckingham and Fluvanna who have Scottsville mailing addresses. The one-year "scholarships" are intended to encourage library use by residents of the Scottsville area living outside Albemarle County. To have the out-of-area card fee waived, applicants need only show proof of a Scottsville mailing address. Such proof includes a photo ID with current address, or a photo ID with one of the following: a current utility bill, check, bank statement, lease, tax assessment, voter's registration, recently postmarked letter, or DMV or USPS change of address. The dream of a library in Scottsville reaches back to the turn of the twentieth century. On June 19, 1902, a benefit was held in “Beal’s Hall.” Guests came dressed as storybook characters, and prizes were given to those who identified the most books and authors. Benefit proceeds became the seed money for a small library situated in an old school building at the corner of Main and Valley Streets. Mrs. J.V. Pereira, the wife of a local banker, opened the library every Wednesday afternoon with the help of Miss Marietta Powers. In 1908, Mr. Pereira built a new bank across the street and the library moved into a room there. When Mrs. Pereira left town, she gave the books to Miss Powers who moved the collection to a small building adjacent to the Methodist Church. Until her death in 1953, Miss Powers worked in the library without pay. She charged a five-cent fee for borrowing a book and used the money to buy new books. With the death of Miss Powers, the 1,000 books of the library were purchased by local resident, Grover Cleveland, for $40. He donated the money to the Scottsville Volunteer Fire Department. Although Scottsville was without a library, the bookmobile came from McIntire Library in Charlottesville and parked two hours a week in front of the school. This cooperative venture of the two political systems of Charlottesville and Albemarle County marked the beginning of the regional library system. By the late 1950’s patrons wanted expanded service and worked diligently towards opening a library in a former drugstore on Valley Street. 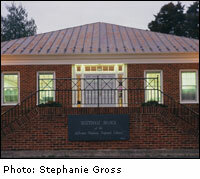 The Scottsville Branch Library opened on June 4, 1959, with 1,500 donated books. There was a grand opening reception attended by several local writers. Open for sixteen hours a week, the new library was governed by a local board, with rent of the building and the salary of the branch’s first librarian, Mrs. Brent Dorrier, paid by McIntire Library. The new branch was a great success. The next six years saw circulation and bookstock grow dramatically and Mrs. Louise Philpott succeeded Mrs. Dorrier as librarian. In 1965, the library moved into a former two-room schoolhouse on the corner of Bird and Page Streets. Renovation of the building by the Fairhaven Garden Club, Uniroyal, Lions Club, Chamber of Commerce and other volunteers, according to Scottsville on the James by Virginia Moore, afforded “a large pleasant room where the librarian, Mrs. Mary Stone, was ready to help any patron who wanted to sit and read periodicals or check out books”. For the next 15 years many improvements were made to the building, the collection grew to 13,000, and circulation rose to over 25,000 a year as the library became an increasingly important community resource for learning and recreation. In 1975, Mrs. Louise Holt became branch head. In September 1980 the library was hit by lightning and almost totally destroyed by fire. Now the community spirit which helped Scottsville survive a number of serious James River floods surfaced as, a small army of volunteers transformed an old cannery building across the street into a temporary library with donated books and the 1,700 books which could be salvaged from the damaged collection. In May of 1982, ground was broken for a new building at the site of the old one and on December 29, 1982, the current 3900 square foot building opened, furnished with a collection of antique reproductions given to the McIntire library by Charlottesville philanthropist Paul Goodloe McIntire. In May, 1988, Mrs. Marianne Ramsden became branch head. She was succeeded by Noelle Funk and the current branch manager, Kathleen Burns The Scottsville Library, now open 48 hours a week with a staff of four, boasts a collection of more than 21,000 items and a circulation of approximately 7,000 items a month.